Ultimately, everything your business does should be about efficiently delivering value to customers. If you don’t focus on clusters of like-minded customers, their needs will be randomly observed by different people in your company at different times under different conditions. Not an efficient way to develop new products—your lifeblood. 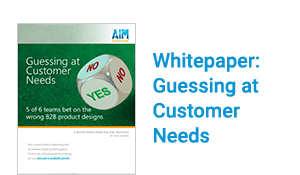 More in New Product Blueprinting article, How’s Your Market Segmentation?